Real estate mailers include any of the variety of direct mail pieces you can send to prospects in your farm area to solicit leads, but are most often comprised of real estate postcards. 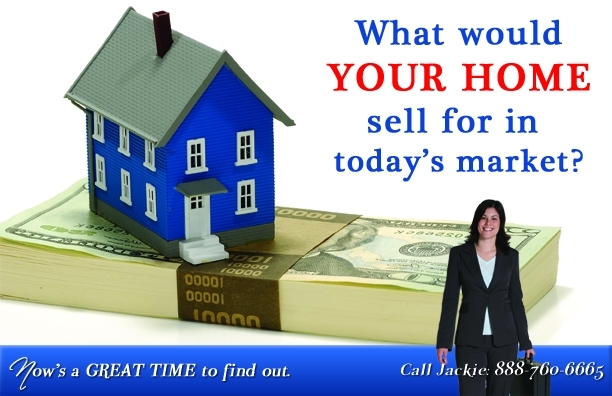 Real estate mailers are an inexpensive and effective method of gaining leads and building name recognition. Here are the top 25 real estate mailer tips and examples on how you can use them to dominate your farm area. Consistency helps to build your brand and reputation in your farm area. The above template is from the ProspectsPLUS! Market Dominator program, which will automatically send out a real estate mailer on your behalf every single month. While ProspectsPLUS! will generate the content for you automatically, you can customize it to the specifics of your area—such as local market statistics—any time you choose. 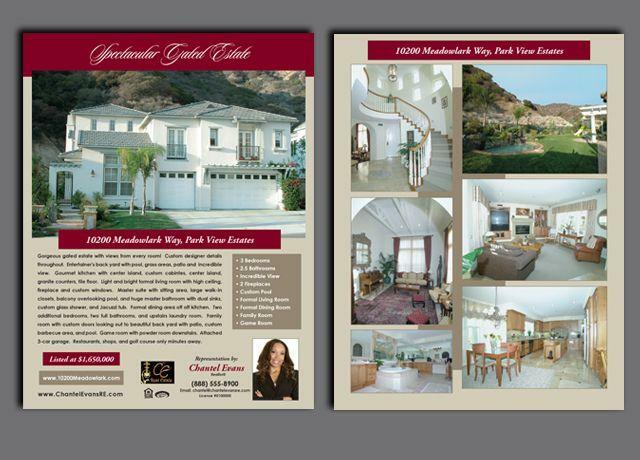 Rather than real estate postcards, consider sending full page flyers for some of your more impressive listings. Unlike postcards, color flyers allow for more imagery and a better sense of the space than a simple real estate postcard mailer. 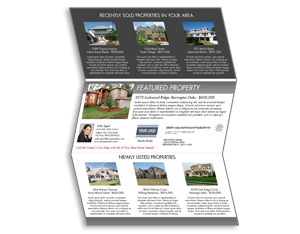 This real estate mailer template by VistaPrint gives recipients a thorough overview of the property and is perfect for generating leads. 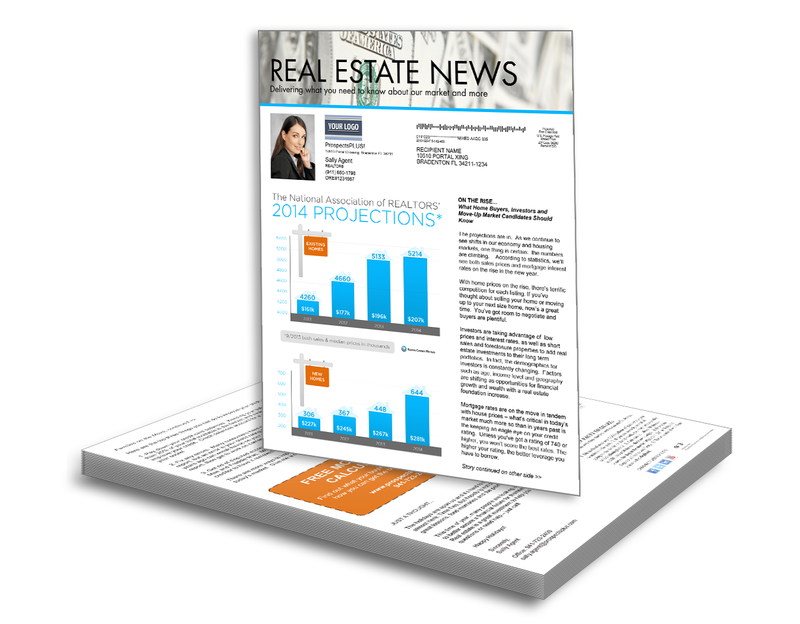 Using long flyers help real estate mailers stand out from the rest of the recipient’s mail. 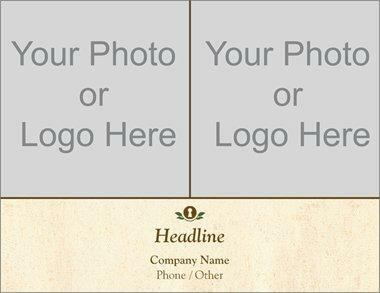 Including eye-catching images in your template that highlight the property can be a winning strategy to help gain exposure for your listing and services. We liked this customizable template by VistaPrint not only for its shape, but also its general layout and the ability to use imagery and color in ways that catch attention. 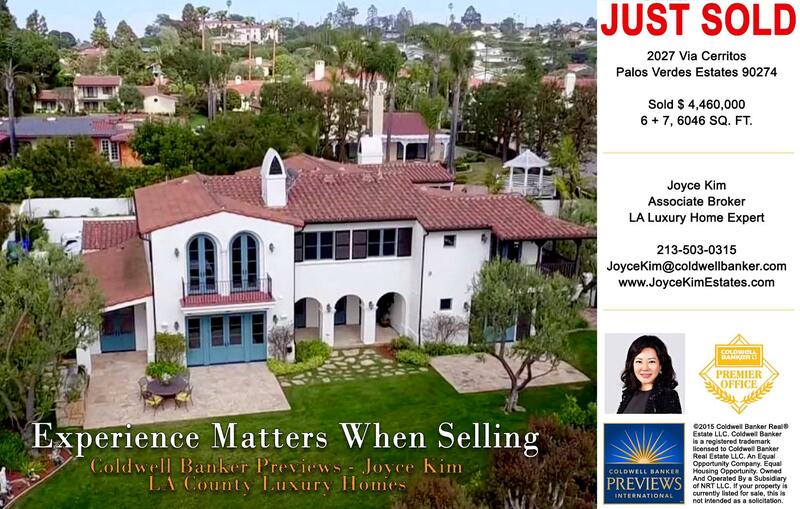 Gorgeous listings deserve a big presence, and this real estate mailer gets attention. No one expects large, glossy flyers that appear like the cover of a magazine, and this is exactly what this oversized flyer, at 11 inches by 17 inches, conveys. If you have a boutique listing that has an element that will “wow” potential clients, the size of this mailer can put that feature front and center for maximum impact. 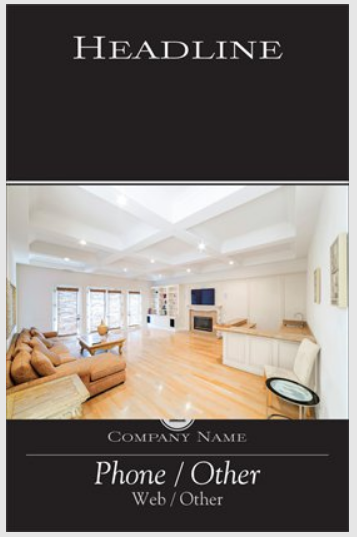 This oversized real estate flyer is a template from VistaPrint, and can be customized to include photos, general listing and company information. Showing off both your real estate skills and your use of drone photography can win new clients in the area who have similar listings that may be coming to market. The property recently sold on the real estate postcard above shows that Kim not only knows how to sell million dollar properties, but she knows how to capture them. To learn more about using drones in your listings, check out our guide to real estate drone photography and video. Giving homeowners relevant information about homes selling in their neighborhood, the days on market, and the median price establishes you as an expert in the current market. Every homeowner, even if not currently selling, is curious to know how their home stands in the market. Having real estate mailers that give homeowners current information they want on a regular basis may even have them looking forward to your monthly real estate mailings. For other real estate marketing strategies, check out our article on 52 creative real estate marketing ideas the pros use. 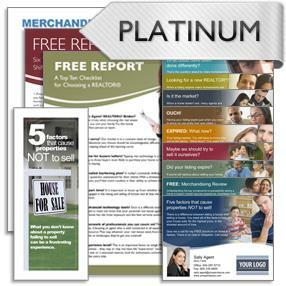 Platinum Expired Listing Kit by ProspectsPLUS! Have your messaging be consistent with a variety of real estate mailers that are included in an expired listing kit. This particular kit from ProspectsPLUS! includes jumbo postcards, brochures, and PDFs. You can hit the same prospect in a variety of mediums, and use the same materials to prospect others similarly. Have potential clients impressed enough with your flyers to take the next step and explore further. Whether showcasing rentals or listings, making your flyer feel distinctive or luxurious can have an impact on how interested prospective clients will be to view the potential property, and reflects favorably on the agency that sends it. This particular flyer is a customizable template by VistaPrint. Trifold brochures can help you deliver multiple, high-impact points that work well for specific groups. In the example above, Brenner does a fantastic job delivering three very important messages with this trifold brochure that can speak to her intended audience. By making a guarantee of sale, assuring the highest price, and giving her contact information, she hits a home run with expired listings. If you need more expired listing leads, we recommend REDX. For $59.99 per month, they deliver expired listing leads to you daily. Whether using traditional real estate postcards or a real estate flyer, selecting bold color to draw attention to areas you want to highlight is an important way to direct attention. 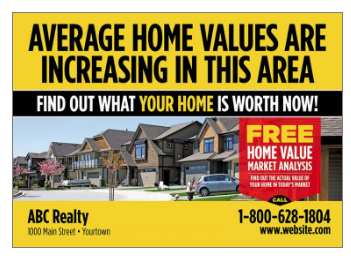 Notice in the real estate postcard above how the user places red in the area for a free home value market analysis. 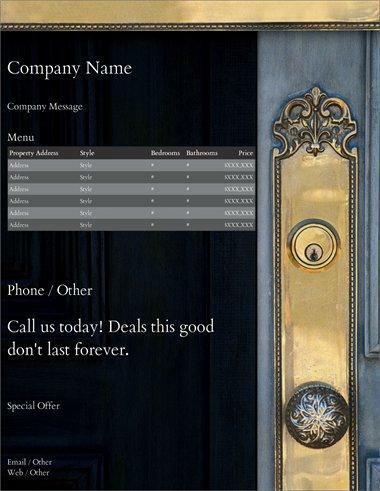 This is intended to direct the potential client to call and set up an appointment, opening the door to further conversation. Comparative market analysis (CMAs) are popular ways to interest potential sellers into contact. To learn more about them, here is our article on how to run a CMA the right way. 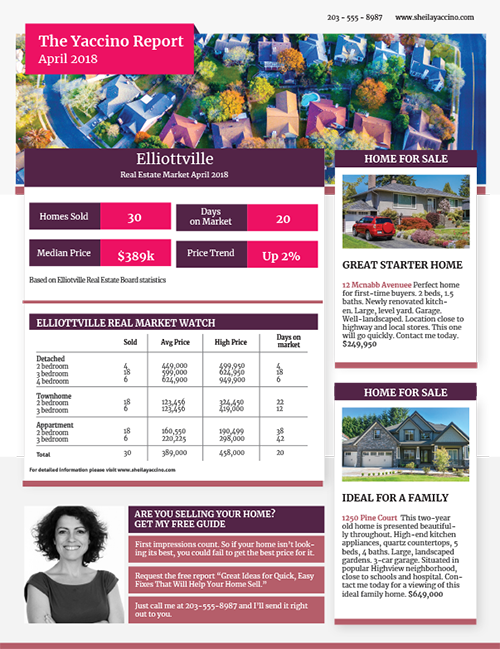 A real estate newsletter keeps the community up to date on your local housing market, and makes homeowners feel informed. While the purpose of the newsletter is to advertise your skills, the newsletter allows you to do this in a way that is not overtly pitchy. If, every month, your farm area begins to see that you are in touch with market fluctuations and are giving solid information, you will build trust and authority when the time comes to sell their own home or search for another one in the area. The newsletter above is from ProspectsPLUS!, and content can be as automatically generated or customized as you wish it to be. Customizable community newsletter by ProspectsPLUS! By using a community newsletter to talk about local upcoming events, like pumpkin picking and tree lightings, you increase the likelihood that your newsletter will be kept. You don’t have to always be talking about the market to put yourself in a position to win in real estate. In fact, often just being involved in the community and a demonstrating yourself as an involved local expert can bring incredible leads. 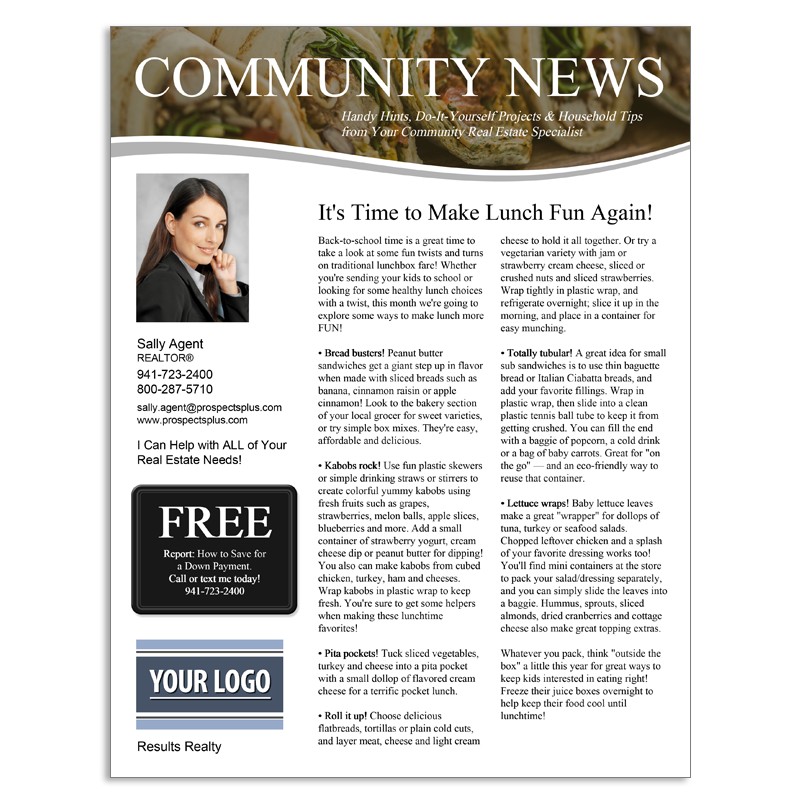 The template above is a community newsletter from ProspectsPLUS! and completely customizable. Add your favorite upcoming community events, and be sure to include “best kept secrets” only locals know. Creating more formal real estate mailers for your open house makes the invitation seem far more personal rather than a typical mass mailer, and may increase likelihood of attendance. Though this invitation will be sent to many people, the distinctive nature of it gives the same feel as a party they might anticipate attending elsewhere. This open house invitation is from a template by VistaPrint, which has many options like this one that can be completely customized to suit whatever type of open house you might be having. Do something new in your neighborhood and send out formal invites to your next open house! Along with demonstrating market penetration, listing sheets leverage the power of neighborhood networks by showcasing your current listings in the area to homeowners who may have friends or others who are looking for properties. By using a listing sheet over a postcard, more information can be given along with photographs to give homeowners a more complete picture. To learn more about how to formulate and use referral networks, read our guide on real estate referrals and how to get leads. Limited availability creates urgency. When paired with useful information to a targeted audience, offering something free and limited can be a winning combination for lead generation. Whether on an oversized postcard or flyer, this message can be sent directly to renters in larger buildings or small, and usually get a solid rate of return for those exploring their options. While not everyone is ready to purchase immediately, playing the long game and being a knowledge resource fills your pipeline and builds reputation. If you’d like more ideas on how to get leads, read our article on the top 43 real estate lead generation ideas from the pros. Keep it simple, and get your message across to your audience. The postcard above is clear in message, easy to read, and has a specific call to action. While it’s tempting to want to tell potential home sellers a plethora of information, doing so often congests the space and doesn’t give the recipient a reason to reach out. Often the postcards or mailers that seem so simple are the most effective in getting potential leads to pick up the phone. While we hope our potential clients are picking up the phone, it’s important for all Realtors that they do as well. Here is our beginners guide to cold calling to get you started or refine your skills. With so many Realtors sending out real estate mailers of all sorts, having a unique value proposition helps your message stand out from the crowd. Telling them about what makes you different from the others is a way to resonate with that potential client who might have just this issue as a pain point or area of concern. People are far more likely to reach out when they feel that their needs are understood. If you sometimes struggle with how to communicate with clients more effectively, we list the top 23 real estate books that will help you become a more well-rounded agent. Customized folders make you look professional and competent even before you arrive at the door. When sending out your pre-listing materials for your upcoming appointment, have it arrive in a customized folder to make an impression. If homeowners are taking more than one appointment, as many do, they will be receiving more than one pre-listing package. Have yours arrive in an organized and custom fashion to kick off the meeting on the right foot. These folders are from ProspectsPLUS!, are completely customizable, and have a pocket to hold your sent materials securely for arrival. Using customized cards to thank clients for trusting you with such a large purchase or sale is a memorable professional touch. Thanking clients and asking for referrals should be an ongoing lead generation effort, so be sure to send out materials you would be proud to represent your business, as well as something that feels more personal than traditional Realtor or brokerage stationary. 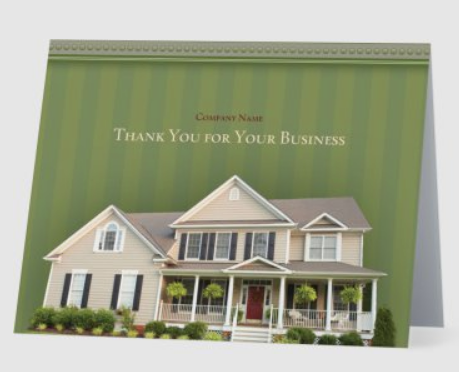 The above note card is one of many customizable real estate note card options available through VistaPrint. Using stock photography can make you seem disconnected from the community you serve, and recipients less likely to engage with the material you send. The photos do not always need to be recognizable town features, but can be of local blocks, events, and other things that people would know in their area. People are far more drawn to photos they recognize, and will spend more time looking at your postcard or any real estate mailers if they contain local images. Consider using a template that allows you to completely build the material you send with local images. VistaPrint has a number of customizable options for real estate mailers such as the postcard above. Using the majority of your flyer real estate to present the home is the best use of space for most real estate mailers. 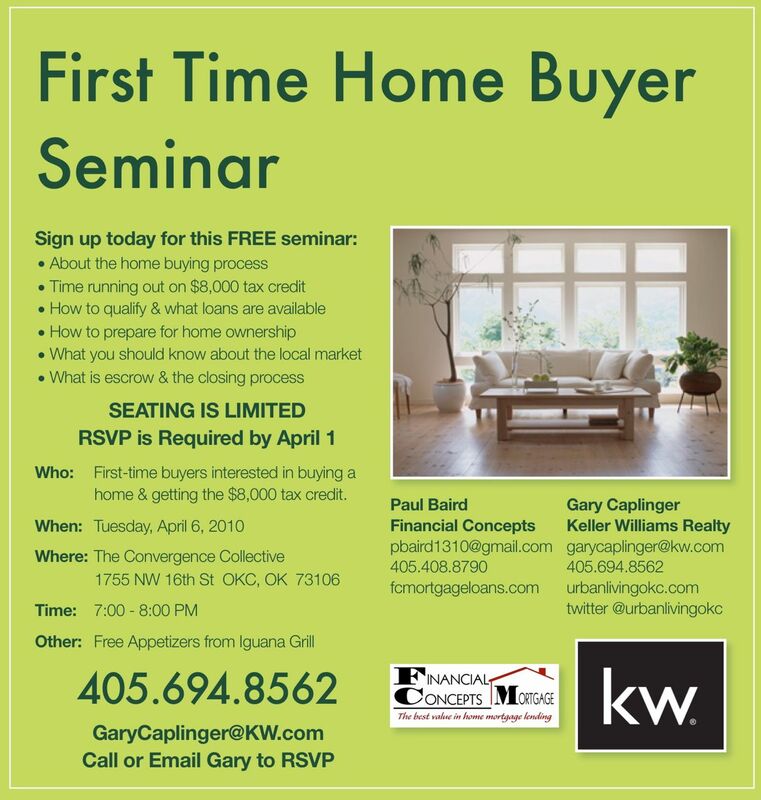 Showcasing the home gives recipients a reason to contact you, while listing your credentials does not. This agent does a fantastic job using almost every inch of the flyer to lay out the magnificent home. While she is professionally and thoughtfully represented on the front, the agent is savvy enough to understand that it is the features of the home that will bring buyers to the table, not more information about the agent showing it. If you are looking for more templates develop your flyers, we’ve gathered the top 25 real estate flyers and free templates for you to check out. 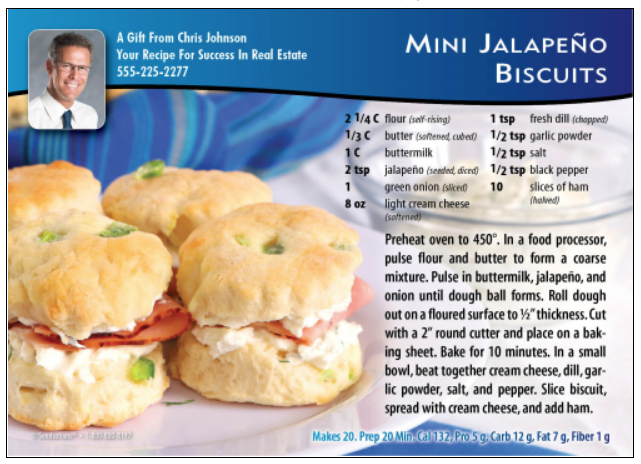 Recipe cards are a favorite because they are often real estate mailers that people keep. While many of these recipes are provided for you, if you have a family favorite that you’d like to share that is easy and appeals to many, it might just keep you on the refrigerator or in the family kitchen much of the year. It’s especially useful to send recipe cards during holidays, when people often have more guests or family around the home they have to entertain. 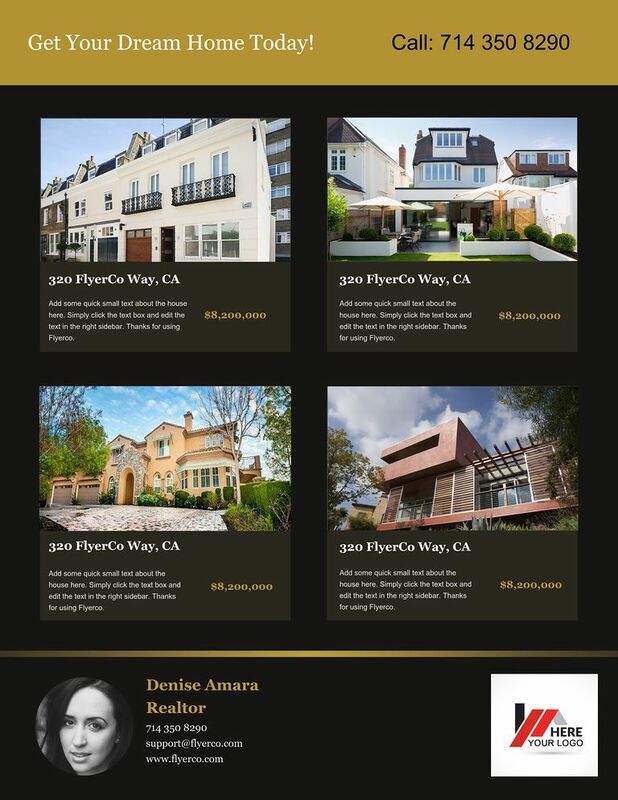 If you’d like further tips on how to use real estate postcards for maximum impact, see our article on real estate postcards. 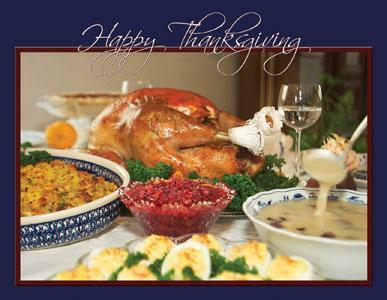 Holiday postcards are an inexpensive but thoughtful way to show your gratitude to former clients and stay top of mind. 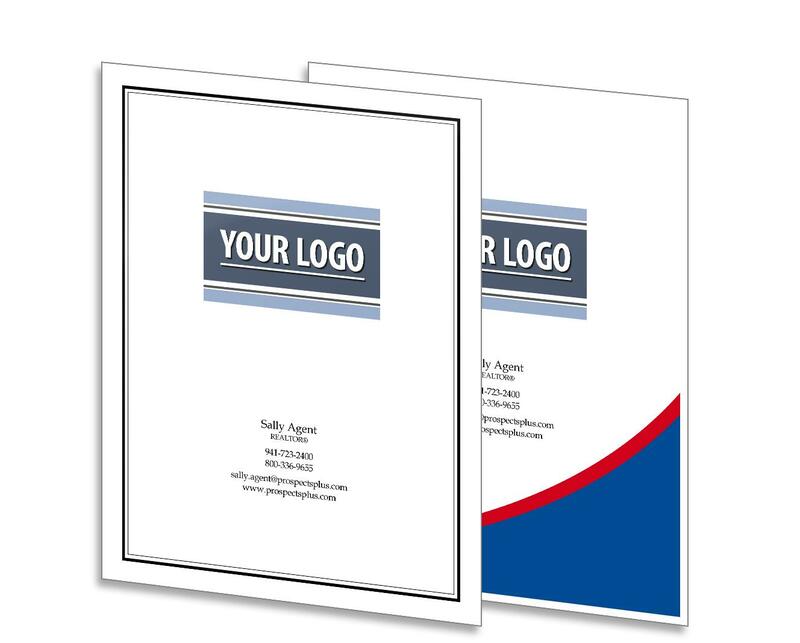 Let previous clients know you have appreciated their business, and be sure to go beyond the standard printed material. If you can, add a brief, handwritten message that refers to something more personal or fun, and wish them a genuinely happy holiday. While certainly not standard, if your farm area is in a booming vacation spot, you may have to show homes during the holiday season. If you do, check out our six steps to a successful open house for realtors, along with a free checklist for you to use. Customizable mailed brochure by ProspectsPLUS! Rather than just focusing on selling clients or first-time homeowners, a mailed brochure allows you to show the scope of your work and capture a variety of lead types. 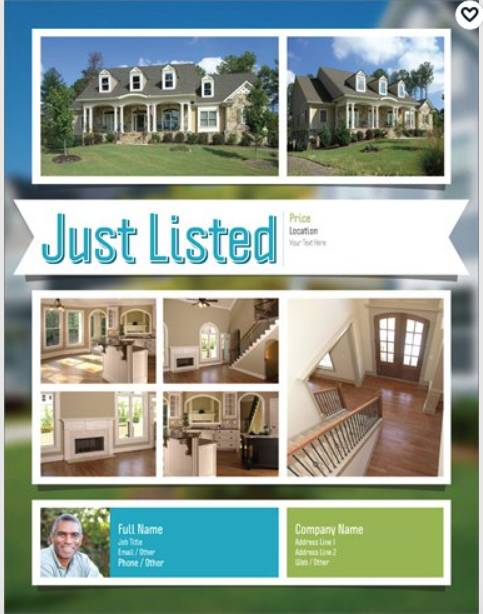 With a customizable brochure such as the one above, you can show your listings in one section, a featured property in another, and even show photos of recent closings. 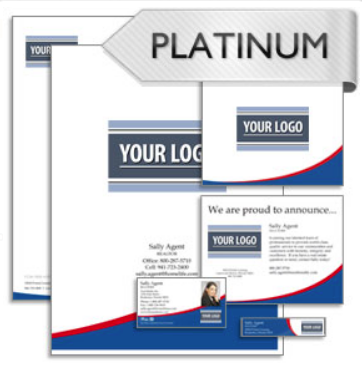 The above customizable mailed brochure is available through ProspectsPLUS!. Customize a brochure like this however you wish to gather the leads most prevalent in your farm area. 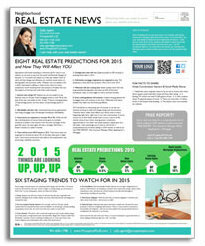 Real estate marketing package by ProspectsPLUS! Real estate mailers aren’t always formal and specific campaigns, and can sometimes be off-handed notes of thanks or a personal follow-up with a prospect. Having branded marketing material, such as custom note cards, announcement cards, letterhead, address labels, and envelopes, can come in handy for occasions when you just want to drop something in the mail that is professional and represents your company well. 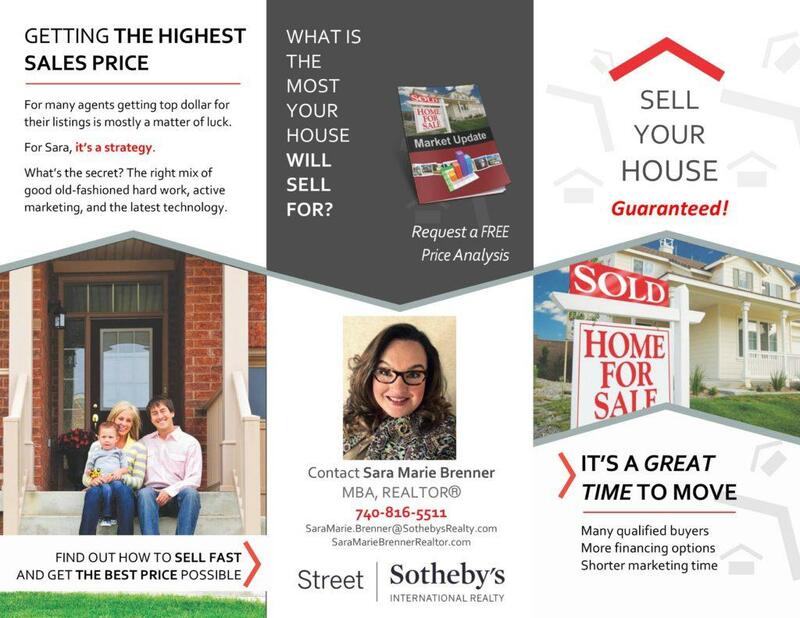 The custom real estate marketing package above is by ProspectsPLUS! and can be customized to your agent or company needs. The top real estate mailers optimize for attention, consider prospective client needs, and frame the agent in the best possible light. When sending out your next real estate mailers, be sure to consider who your target demographics are within your farm area, and design your mailings to best meet the needs of those groups. For more tips on how to position yourself as a powerful brand within your farm area, see our ultimate guide to real estate branding.